After a long gap we visit our facebook page and got curious when we found Doctor Frost an upcoming drama in the notification. So we searched what it is about. OMG its OCN 's new drama and you know we are found of OCN concept based dramas. The y are unique in story, cast and many things. Doctor Frost is the upcoming korean drama based on web comic. It will going to start from 23 november 2014. The official poster was very catchy. 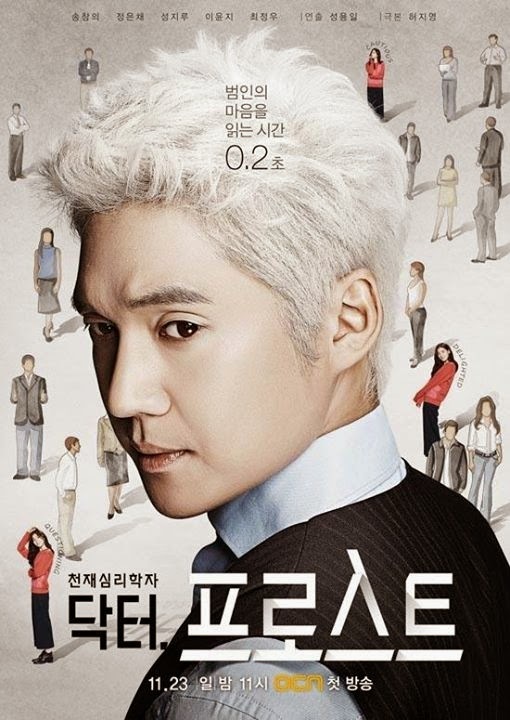 The main lead Song Chang-Eui with the white hair getup playing the role of Doctor Frost the psychology counselor. The story seems to be very interesting and unique as the official poster attracts our attention. We hope same goes with the episodes. Other than Song Chang-Eui we are very excited for Lee Yoon-Ji. Before we had seen her excellent acting skills in The Kings 2heart. Best of luck to the team for now watch the first two official trailer below. Post by Doctor Frost 닥터 프로스트.